Dressed in a golden, laced gown, Noor was relieved to wed a man she had met briefly online, ending years of pressure from her Pakistani family to marry. As lights flashed and guests danced merrily inside an English wedding hall, Noor felt she might finally be free to live her life as a lesbian, since her new husband was a gay man. 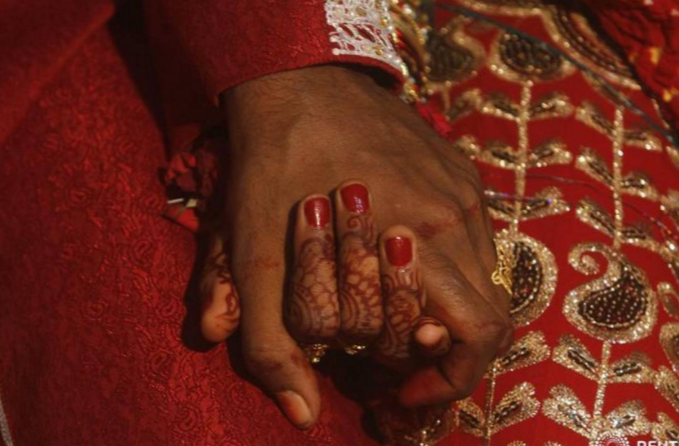 “In our culture, there’s a really huge pressure to get married. My family were like, ‘Find someone for yourself or we’ll find someone for you’,” said Noor, who declined to give her real name as she has not come out yet. Being LGBT remains taboo in some cultures in Britain, and campaigners say that coming out can lead to forced marriage, disownment, expulsion from the family home, and honour-based abuse. The pressure to marry can be so immense, some young lesbian and gay people have resorted to marrying each other to appease parents and their community with a marriage of convenience. “When I heard about that, I really quickly decided that that was the thing I needed to do,” said Noor, who had her religious wedding last year. “It felt rubbish because they were all so happy for me and I wasn’t happy at all. I had to go to this extreme to make them happy,” the 24-year-old told the Thomson Reuters Foundation in a phone interview. More than 1 million people, or 2 percent of the British population, identified as LGB in 2016, according to official data, which did not include trangender people. Although Britain is one of a handful of countries where LGBT people have equal constitutional rights, discrimination remains rife. Incidents against LGBT people were the second most reported hate crime after racism, accounting for 13 percent of some 93,000 incidents reported in the year 2016/17, police data showed in July. LGBT rights charity Stonewall says those from black, Asian and minority ethnic (BAME) backgrounds suffer more, with 34 percent experiencing a hate crime in 2017 alone, compared to 20 percent for white LGBT people. Half of all BAME individuals surveyed in June also faced discrimination, racism, or exclusion by other LGBT people, Stonewall says. But violence in the family home is most alarming, charities and activists say, since it often goes unreported and hidden. “The reports of abuse are so low because it’s so difficult to admit that it’s happening (and) that the people doing it are your entire family,” said psychologist Roxanne Khan, director of British-based Honour Abuse Research Matrix, a global network of professionals working to end honour abuse and forced marriages. The Freedom Charity, which helps victims of forced marriage, says some parents coerce LGBT children into marriage in a bid to rid them of homosexuality and save face among their community. “People are leading dual lives and having to do what their parents want. Everyone is a victim here; the partner is a victim, the person who’s forced to marry is a victim. So it’s a horrendous situation,” said Aneeta Prem, head of the charity. The government’s Forced Marriage Unit said they had 21 reported cases of LGBT people who were forcibly married in 2017, and 30 cases in 2016. Many more cases go unreported, it said. British charity Karma Nirvana, which runs a helpline for victims of honour violence and forced marriage, said it had noticed an increase in calls from LGBT people. Its head, Jasvinder Sanghera, said she knew of extreme cases where gay men were whipped in family-sanctioned exorcisms. “They are made to feel like who they are is dishonourable and shameful, and they have had exorcisms performed on them involving whipping or beatings,” she said in an interview. For Nazim Mahmood, being confronted by his deeply religious family about his sexuality was so distressing, the 34-year-old ended his life in 2014. His fiance, Matthew Mahmood-Ogston, said they had kept their love hidden from Mahmood’s family for 13 years. “Imagine as a couple you couldn’t walk down the street together because you’re worried that your family might see you,” said Mahmood-Ogston, who now runs a support group for LGBT people from strict religious families. The pair’s story inspired recent episodes of popular British television soap, Coronation Street, in which a South Asian woman is confronted and shamed by her family for dating a woman. It is a terrifying scenario that Adam, who did not reveal his real name, has anguished over for years. Coerced into marriage at 18, Adam said he had suffered mental breakdowns and still fears for his life should his family ever find out the truth about his sexuality. “I’ve emotionally broken down so much, I don’t know what to do. I don’t want to leave my family but at the same time, I can’t live the life that I want,” Adam, now in his early 20s, said in an interview. Adam said he was certain that if he ever came out, he would be thrown out of his home – or worse. “I tried to reach out to my family for support but they were having none of it. I said to my mum, ‘What if I am gay?’ and she said, ‘I’d end you and I’d end myself,'” he said. “My big brother is very traditional, backward-thinking and quite violent. And I’m very fearful of him,” Adam added. Psychologist Khan said many LGBT people experience severe distress, choosing between sexuality and family, especially if they are religious. She said that often leads to depression, loneliness, self-hatred, low self-esteem and suicidal thoughts. “The inner conflict is as powerful as the external threats. They believe they are worthless and sinners, and are trying to reconcile that with trying to make their family happy,” Khan said. It is a struggle that Noor has known all too well. When her fake marriage ended after a year, with her family none the wiser about her sexuality, Noor lived in her car temporarily out of shame, fear and guilt. Still, the pressure to marry has not gone away. “I grew up thinking I was a sin, that I wasn’t good enough, that I was abnormal,” she said. “Last month, my family has introduced me to three guys – and each time it’s the same expectation and it’s that same disappointment. It’s like being trapped,” she said.